For most of their long history the Navajo governed themselves through a complex clan system, but when oil was discovered on Navajo land in the early 1920s, the U.S. pushed the tribe to establish a centralized government that could enter into contracts with companies eager to tap their mineral riches. The resulting revenue flow from vast reserves of oil, uranium and coal has fueled the Navajo economy ever since, at huge cost to the physical and cultural health of its people. Wahleah Johns grew up in a traditional Navajo community atop Black Mesa in Arizona where Peabody Energy ran what was the largest strip-mining operation on Indian land, one that drew three-million gallons of desert aquifer water a day to pipe its coal slurry from Hopi and Navajo country across state lines to a Nevada generating station. In 2001 a group of Navajo, Hopi and Chicano students, prompted by a presentation at Northern Arizona University detailing the impact of growing water scarcity, founded the Black Mesa Water Coalition “out of anger and fear” for their future. With the encouragement of an anthropology professor and a few mainstream environmentalists, the coalition armed themselves with the facts and educated and organized their peers. 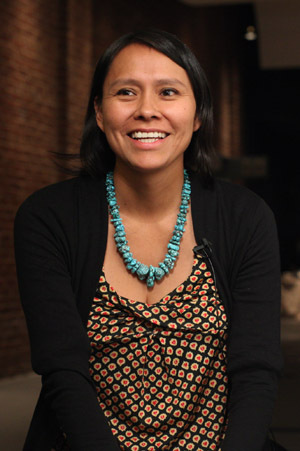 In 2003, the youth-led coalition decided to cut itself loose from the university and reached out to reservation-based activists, including Wahleah Johns who became co-director of the coalition. Together, they launched an unprecedented campaign to challenge tribal governors of communities directly affected to halt the environmental degradation and replace extractive royalties and jobs with sustainable, green alternatives. The young, primarily female coalition’s upstart activism and demands for inclusion and transparency sparked outrage from many quarters. Some tribal leaders, fearing the collapse of their economy, castigated environmental groups “as the greatest threats to tribal sovereignty” and banished them from their lands. Johns and her team remained undaunted. They “translated” green into Navajo values of reverence for the earth, air and water, as well as respectful intentions toward others, and held a series of inclusive full-day gatherings to field-test their appeal. Youth organizers made presentations to schools throughout the reservation and field coordinators fanned out to build support among 110 chapter councils in a largely unmapped, unpaved territory the size of Ireland. In July 2009, the Navajo became the first American Indian nation to enact green jobs legislation. The Navajo Green Economy Act established an as yet unfunded commission to democratize tribal decision-making and speed the transition to a more sustainable future. The Navajo people have long engaged in green practices like ranching, weaving and farming. Now as one of five appointed Navajo Green Economy Commissioners, Johns wants to build on these indigenous skills to grow profitable local initiatives such as mixed-breed wool mills, arts and rug collectives, free-range meat and organic farmers’ markets and home weatherization services. Where thousands live without electricity, Johns is also exploring creative ways to finance larger scale, reservation-based, clean energy initiatives such as solar power generation. When Wahleah Johns envisions the future of a prosperous, green and transparently governed Navajo Nation, independent of fossil fuels and federal payments, she and her husband have some special stakeholders in mind: two-year-old Tohaana (Protector of Water) has just begun to talk and their infant daughter Alowaan (A Song) was born in May.